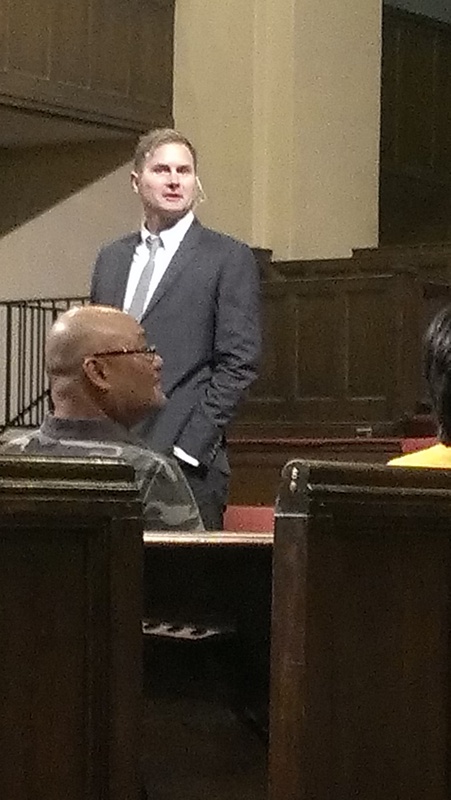 Rob Bell gave a lecture tonight at First Baptist Church of Pasadena to promote his new book, “What We Talk About When We Talk About God.” He kept repeating a phrase that was incredibly revealing. The crowd was about 300 people, almost all students of Fuller Seminary, which had promoted the event. I should say, in the world of hipsters, hats are apparently completely out after having been completely in for about a year. The crowd was maybe 50/50 on the gender split, mostly around 30 years old, and heavily Caucasian. An one hat. At the end, in a Q&A period, a couple of students asked some really smart questions. They asked them humbly and hesitantly, so I’m not sure if everyone understood how sharp they were. One person observed that Bell keeps talking about the God who is “ahead of us, pulling us forward.” In Bell’s cosmology, God’s primary goal is progress. God is working to get us to “the next step,” and there’s no judgment for being in your present place (I’m not sure if these means theologically, morally, or in terms of mental health). “What about the fact that the Bible seems like it’s behind us then?” the student asked. Bell rambled on this one. He said that the Bible was in fact progressive for its time, which only left open the possibility that it’s not progressive in our time. Rather than linear answers that addressed the questions, Bell tended to float around verbally to different illustrations which were not always on topic. Another student followed up, “Let’s say you have a friend who is a spiritual seeker who reads about Joshua killing the Canaanites,” he began. “Who picked that text?” Bell teased. Then he answered that “You can just start with Jesus and work your way back from there.” He referred the student to a British theologian whose name he couldn’t remember who argues that it wasn’t actually genocide (I think he’s referring to Christopher Wright, though Wright actually says that the Canaanite slaughter was as bad as it sounds, and God was just accommodating that context). Bell simply dodged the question. Which brings me to absolutely the most interesting part of the night. Several times Bell referred to doctrinal accuracy with the phrase, “Getting the mental furniture in order.” He said, “Instead of trying to get the mental furniture in order, which you’re never going to do…”, we should instead gather around the eucharist and make sure everyone’s needs are met. What’s shocking about this is that Bell isn’t taking his own advice. Bell very clearly thinks he understands God’s nature, and very clearly thinks that “the institutional church” is getting it wrong. He says that if we believed (aka got the mental furniture in order) that God was with us, for us, and ahead of us, this generation would be more interested in God. This is just contradictory. If getting God right is important, we can’t very well dismiss doctrine. Bell threw in an aside, “Sure, some doctrines are helpful.” But he seems to be missing the heart of the exercise that he himself is taking part in, which is the revision of doctrine. He’s absolutely right about what’s at stake – a mistaken understanding of God turns people away from God. The problem is that the God who is always leading people towards progress without judgment isn’t an entirely accurate picture of the biblical image of God. Bell has moved the furniture while denying that the placement of the furniture matters. The upside of Rob Bell is that he really believes that people need love. He thinks that they need to know Jesus. He just doesn’t seem to think Jesus jibes with the God of the Bible, including the God that Jesus himself describes. Bell needs to have a come-to-Jesus talk with himself where he admits that he has intentionally ordered the mental furniture to arrive at his present theology. Then he might realize that he’s got the furniture in the wrong places. And maybe then we’ll find the hat rack. Pastor, are you familiar with Jim Wallis (Sojourners Magazine)? Probably along the same lines of thought and belief. Man-cnetered, needs-driven religion of Bell is a travesty. As if a loving, omnipotent, all-knowing God needs Bell or anyone else to assassinate the truth of who God is, who were are before Him, and what God expects from us who sin against and/or serve him (doctrine). Bell has derailed who knows how many people’s faith and given them his imaginary teddy bear, instead. Sad, truly sad. If you love someone–you tell them the truth, including doctrine, lovingly–you don’t give them some mumbo jumbo about can we really know, and all that garbage. We all sin against our Father, and Jesus is the only remedy for that sin and the broken relationship with God that it causes. I have been following Bell since his first book came out and your article is right one in its conclusion. Glad you went and reported on it. I thought about going to check it out, I decided against it because I had seen several of his stops on his book tour and it’s generally the same spiel every time. Seems as if this stop was no different. This may be the correct weblog for everybody who desires to discover that topic. You realize quite a lot of it is almost tough in order to argue on hand (not as well When i would likely want…HaHa). You will put a brand new rewrite using a theme thats been discussing for decades. Great stuff, only excellent!